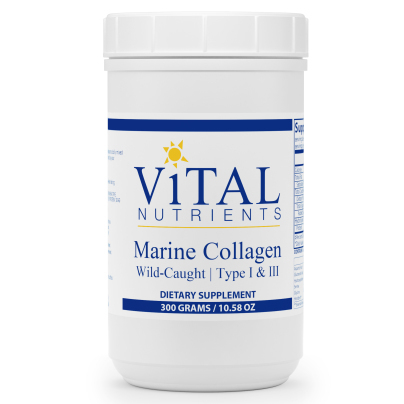 Fish collagen peptides are comprised of two types of collagen, types I & III. Type I and Type III collagen benefits include promoting healthy hair and nail growth, improving skin elasticity and hydration, as well as supporting joint health and function, and bone strength. * Our hydrolyzed collagen powder, contains no odor or taste, is easy to digest, and readily dissolves in liquids or soft foods. Marine Collagen is Non-GMO, Hormone and Antibiotic Free, and Gluten Free, and contains no additives, preservatives or sulfites. 2 rounded tablespoons daily mixed in 6-8 oz of water or juice, or as directed by your healthcare professional. Does not contain coatings, binders, gluten (wheat, rye, barley), milk/ dairy (casein, whey), soy protein, egg protein, sugar.